We’re so excited to see that Elizabeth Anne Designs featured this wedding with all of it's romantic and beautiful details. Big thanks to Danielle Gillett from Danielle Gillett Photography, APIS Floral and all of the other vendors involved in making this wedding such a dreamy one. See the full post and list of vendors here at Elizabeth Anne Designs! Paul and Gabi wanted a wedding filled with family and friends; they wanted it to be personal and unforgettable. Every detail was important, from her flower hair clip, made from her mothers veil, to the aisle lined with photos of parents and grandparents on their wedding days. 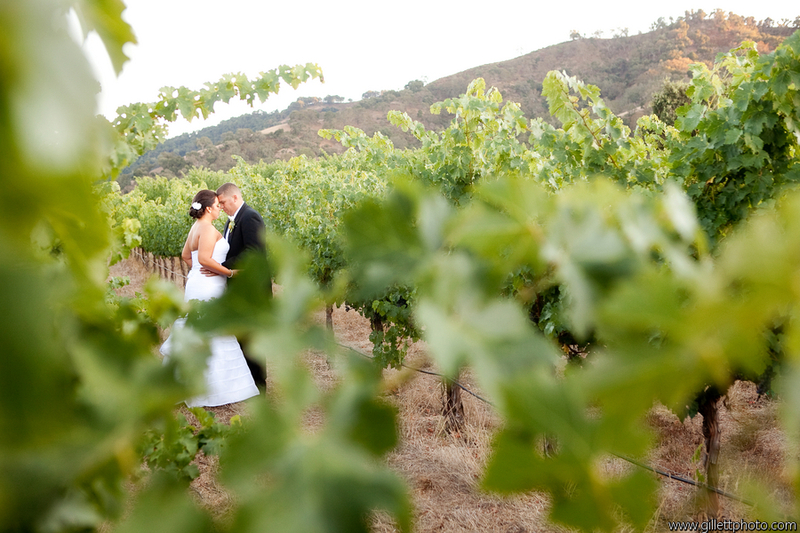 The natural beauty of the venue, Clos LaChance winery, was enriched by every detail. Flowers tucked in glass bottles danced in the wind behind the ceremony while candles and stunning bouquets lined every table. They had guests from as far as Bulgaria, and as traditional Bulgarian music filled the air and guests laughed and danced, you knew this day would be remembered with joy in the years to come. This perfect day was made even more fun by the company and teamwork of Danielle Gillett! Check out a few of her stunning photos below. She is a true artist and could not be more enjoyable to work with!